Some stories are just too crazy to try to tell. Like that one with the underwater cave inhabited by the yellow-eyed octopus and the super heroes. Other stories, though, just have to be told, no matter how crazy. I was standing at my desk getting some papers ready for the FWF session next week when I heard a soft click come from behind me. Suddenly grand, dramatic music began playing, but at a rather subdued volume. I turned to see that a tiny white speaker hooked up to an even smaller media player had been propped up on the bookshelf at the other end of the room. And although this in itself was unusual, the thing next to the speaker on the bookshelf was what really threw me for a loop. There’s really no way to prepare yourself for this kind of thing either, I’ve found. He began singing and dancing to the music, with me as his sole audience. Surprisingly enough he could carry a tune, although his lyrics were a bit on the wonky side (but I was honestly too stunned to complain about such a triviality). When his short performance came to an end – with the lyric: Oh yes I am a shark, now you see/Please won’t you bring me some broccoli? – the dramatic music coming to a theatrical finish, he stared up at me expectantly, obviously waiting for some sort of response. Well I’m sorry but I just don’t know the proper etiquette for this sort of thing. Which is something I suppose was blatantly obvious what with my just staring at him. I groped around for the right thing to say, assuming “the right thing to say” even existed in a situation like this one. Eventually I settled on, “It was certainly interesting.” I attempted to smile politely, but I think it came off more as a grimace. The little shark didn’t seem to notice though; he just beamed brightly, pleased with the whole situation. I knew I probably shouldn’t ask any questions. I mean, when a tiny shark comes into your house, sets up on your bookshelf and begins singing about broccoli, it’s probably just best to accept things the way they are and not probe too much. Leave well enough alone. But I couldn’t help myself. He smiled at me in that “duh” kind of way. “You know!” he guffawed. “Everyone knows sharks sing. Silly.” He shook his head, but in an amused, not perturbed way. At that his little face twisted into the most peculiar combination of recognition and shock. I smiled and tried to contain my giggling. He looked up at me around his fin, a sheepish smile (if you can picture a shark smiling sheepishly) creeping onto his face. “So,” he started, brushing off his embarrassment. “Wanna play Monopoly? I’ll let you be the race car.” He lowered his fin and smiled up at me hopefully. I couldn’t help but chuckle at the notion of playing a board game with a slightly confused but altogether pleasant mini shark, but I nodded readily. I went off to get the game, stopping by the fridge for some broccoli on the way. RND 9) *2sc, dec* (18) – Attach eyes. Stuff. dc in third ch from hook, hdc, 2 sl st, hdc, dc in final ch, sc in same final chain. cut yarn and pull through. Shape and attach to back of shark (if you did not use a joggless color change method I suggest putting the tail were the colors change). As you can see I chose to put the tail on horizontally; this is not meant to be realistic, just cute in my opinion. Turn the tail and attach in so it’s more vertical if you prefer. tc in 4th ch from hook. dc in next ch. hdc in next ch. sc in next ch. sl st in last ch. FO. Attach. decide on placement and pick up a stitch on side of body. ch 4, sc in original pickup. FO. Repeat for other side of head/body. ALTERNATIVE: If you’re not comfortable picking up and crocheting (or chaining in this case) simply ch 4 and sl st in last chain from hook. Attach to body. Using the black thread, stitch on gills. To make an Orca: (1) Follow the same body, fin, dorsal fin, and tail pattern as shark using black instead of grey. (2) Instead of using black thread for gills, use white thread (or yarn) to stitch on eye patches. FO. Attach to head and adjust eyes accordingly. To make a Seal: (1) Follow the same body, fin, and tail pattern as shark using white instead of grey (skip the dorsal fin, just as in the original whale pattern). (2) Using black thread or yarn stitch on a nose. sl st in 2nd ch from hook. dc, tr cr, & then dc all in next ch. sl st in last ch. FO. (3) Stitch the side fin the same way noted in the shark/whale base pattern but make the following changes: Pick up stitch on side of head/body, double up yarn, ch 3, sc in original pick up, FO. Pattern, design, photos, and story copyright Karissa Cole 2012. All rights reserved. On some sad, gloomy days I sometimes find myself wishing my life were a bit more interesting, with more excitement and surprises. But then I inevitably come home from grocery shopping to find two blue whales staring intently at each other on my kitchen table and I realize I’m really quite full up in the interesting, exciting, surprise department. Well, actually, today was the first time that exact scenario played out. But I’ve come to find there’s always something unusual lurking around the next corner in my week. This week it just happened to be whales. It went like I said after running errands: Juggling two jumbo brown bags I fumbled with my keys and somehow managed to let myself in the front door without dropping anything. I walked in the house, kicked the door shut behind me, doing good maintaining my balance – at least until I saw two miniscule sea creatures sitting right in front of my salt and pepper shakers. I didn’t bother to check to see if I broke the eggs or smushed the bread when I dropped my bags; I was too interested and spellbound by what I saw. At first it looked like these two whales were kissing, and I almost thought to turn away and give them some privacy. When I made just the slightest mention of it, though, the whale on the left scoffed, and quickly explained that the two were immersed in a staring contest. I nodded thoughtfully at that notion, mulling it over, until I realized they were totally without water. Panicking I raced over to the sink, mumbling something about letting an endangered species suffocate in my own kitchen. Apparently these little guys have good hearing though, as the whale on the right – gaze never leaving his opponent – politely explained that although whales live in the water, they breathe air and were perfectly fine. I could feel my face flush when I realized my silly mistake – “everyone knows how whales breathe doofus” – , and then flush even more when I thought about the fact that I was embarrassed in front of a whale in the first place. A new set of questions and concerns hit me then – like, “how did you guys get on my table and how is it you can speak English?” – but I walked quietly back toward the table and, holding my breath, watched the staring match continue. It felt like an eternity before another word was uttered. Finally, the whale on the left asked me what time it was. When I told him he let out a slow whistle. “Best time yet, Peapod!” he exclaimed. At that both whales let each other out of their attention and turned toward me, with no apparent winner to their battle. When I questioned who had won, they simply stared at me with perplexed expressions. I explained that usually, in a staring contest, whomever blinks first is the loser, leaving the other player the winner. They both laughed lightly at that, saying something about how silly some bipeds can be. I brushed it off and decided to see if I could get some answers to more pertinent questions. Before I managed to open my mouth, though, a third, darker colored whale came bounding – if you can say a whale can bound, that is – over to us. “Dudes!” he yelled in what I would have before today called a very unwhalelike manner. “The popcorn is getting cold. You coming?” He then turned to me directly, gave a quick, friendly wave of his fin, and told me that he already picked out a movie for all four of us to watch. The first two whales sprung up and made their way to the next room where the TV had somehow been set up to play Finding Nemo.I hurried to put away my groceries as they called excitedly, imploring to me come watch. As I flopped down onto the couch the third whale gently nudged the remote to me as the other two made themselves totally comfortable on my lap, settling in for a nice evening. Although I was still curious about how they got here and all that, I decided not to bother with trivialities. I figure why question a good thing? I mean, I had after all just gotten three new friends, who cares how? Peapod, the lightest blue whale, is sweet and considerate; Park, the medium shade, is competitive but still caring. And Schmoo, the darkest of the whales, is an all around goofball. And apparently they have a thing for tennis, card games, and fondu. And they’ve also proven to be great at telling jokes and keeping things interesting. So it looks like with these guys around I won’t need to be wishing for a more interesting life, with more excitement and more surprises. They’ll keep me covered for a bit. Funny how things work out like that sometimes, huh? 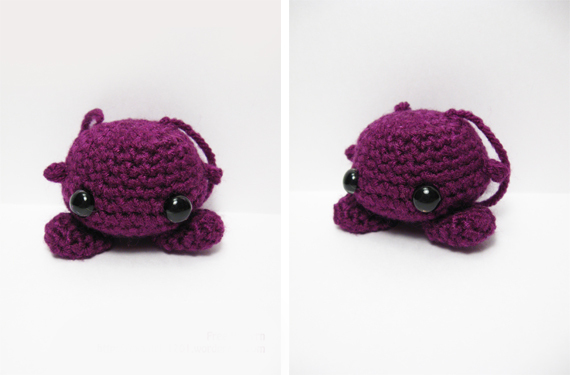 I decided to make some little amigurumi whales because, after looking through all my designs thus far, I saw that I hadn’t used any of my blue yarn. So I grabbed my hook and a skein of blue and started crocheting. And the micro whale pattern was born! I kept it simple to pander to my own short attention span. 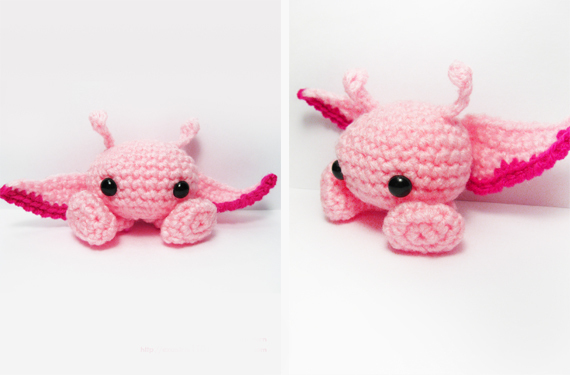 With such an easy pattern I can start and finish one of these whales in about a half hour. decide on placement and pick up a stitch on side of body. ch 4, sc in original pickup. FO. Repeat for other side of head. Also be sure to check out the Sharkie pattern! Today was a fun day. One of the highlights was climbing onto the roof to repaint the dormer. That was a first for me. Most of my day was spent outside repainting and helping with roof repair. I think it was when I was standing on the ladder at some point that I got the idea to take a mini nature walk in my own little backyard, see what I can see. I know that a lot of the stuff I photographed is considered ordinary (and in the case of the weeds and the ‘shrooms, even nuisances to some) but there’s something about looking at it all through a camera lens; none of it’s really garden variety to me. I thought the mushrooms came out kind of neat. There are just a few of them in the backyard and you actually wouldn’t even know they were there if you weren’t looking. Funny how fungus can fascinate me so. . . Although there are some seriously awesome mushrooms out there, you know? As of today it has become my personal mission to photograph them all. I should get cracking. It occurred to me I hadn’t done much work in Apophysis 7x (see this article for info about the program) lately. Granted, this is mostly because the 5-hour renders eat away at my frail, old, hopelessly outdated laptop. But as one of the first digital art forms I took up, I felt I really ought to shake the dust off the 7x icon that usually sits idly in my program files and see what I could come up with, even if my computer put up a fuss. I had a few spare minutes today to input the parameters for the three above images. Admittedly, these itty bitty previews don’t do too much justice to the full size pieces (especially this last one, which looks a whole lot sharper when seen right). But whatchyagonnado. I’m thinking I’ll tweak them a little bit, then release the wallpaper sizes. When I get another spare minute that is. 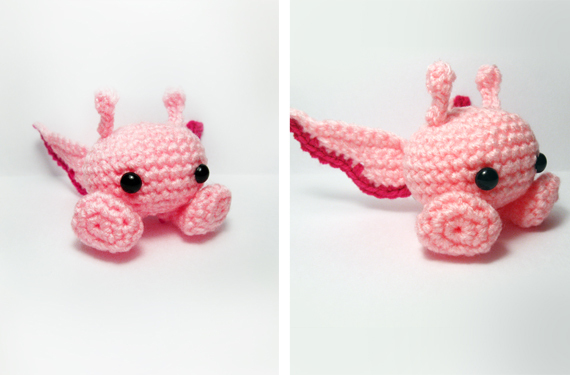 Between writing new amigurumi patterns (got a whole slew of those coming soon! ), staging new photo shoots, brushing up on my PS skills and making new pieces of celestial art, and work which just started up again yesterday, I’m swamped! But I’m happy swamped, so it’s all good. And kind of prolific. Cool. Sounds too poetic for an analytic brain like mine to be totally down with. Eyes can be really expressive though, so maybe it’s true. I couldn’t say. But I can say they can make interesting photographic subjects. Unfortunately the eyes I keep suffed in a jar in the closet don’t photograph that well, so I had to try my own. Admittedly I feel a bit vain in uploading this. But I’m all alone today, so I had nobody to lend me their eyes for the afternoon. Besides, now that I think of it, this might be the only picture of myself (or, erm, part of myself) I’ve ever uploaded to my own blog. If I had photoed someone else things might’ve come out better. It must have been one heck of a funny sight, seeing me twist to try to get a somewhat in-focus shot. Could’ve been worse though. And at the least it was . . . well. . . practice, I guess. Me and my green eyes. I think there’s possibility in them. Or at least, that’s what I see with them. Created somewhat on whim and without excess thought, these are my three simplest patterns. If you’re a speedy yarner you can easily get all three done in one afternoon. Often appearing out of nowhere, Purploids signal their startling arrival by staring intently at you – whether you know it or not. About a week ago I found this out, rather late at night. I soon realized this is just how they size a person up though. Once they’ve decided they like you they’re quite sweet, very protective and excellent sources of good advice. More people could do with a Purploid baby for a friend, but unfortunately so many people are too busy and serious they never even notice when a Purploid has come to visit them. Two Purploids showed up at my door yesterday after have been dejected and let me tell you, a sad Purploid is a heart-wrenching thing to witness. Raise Purploid awareness: they have feelings too! Attach eyes and antennae (to make antennae simply chain 4, cut yarn leaving long tail, and pull through. Attach to head and fray long yarn tail). Stuff. The original Purploid was freeformed and gifted so this version is just slightly different. For instance, the first incarnation boasted a long tail with a pop-pom on the end. 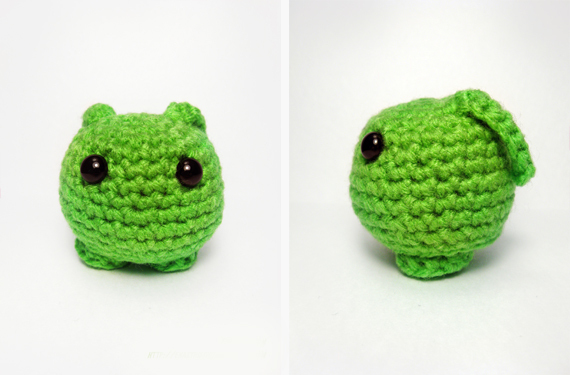 To make this for your Purploid: Ch 21, starting in second chain from hook sc 20; attach to body; make pop-pom (see Melvin post for brief written tutorial for pop-pom creation); attach pom to tail. After you attach all the body parts (mainly the feet) your Purploid should be good to go! While most Pinkloids are pink (just as most Purploids are purple) this is not always the case. Red, orange, and even brown Pinkloids abound. Many people don’t realize this though, and usually assume Pinkloids are all pink. This is a common misconception, but Pinkloids tend to become very defensive about their color if they happen to exhibit a different hue than what their name suggests. I suppose this is why Pinkloids seem to relate to ladybugs quite well; ladybugs know all about being misjudged because of their name. Still, Pinkloids don’t hold too much of a grudge. They’ll just brush it off and get straight back to work. What is it Pinkloids do for work? Well, they’re Word Sprites, of course. Have you ever been trying to say something, but you can’t find the right word, or it’s right on the tip of your tongue, you just can’t seem to get it out? Pinkloids are the ones who come along when this happens. They bring along the missing word and fling it into the conversation before it’s too late. Of course, occasionally a Pinkloid doesn’t make it in time, or perhaps they accidentally brought the wrong word, or maybe even too many Pinkloids converged at once and they all tried to use the word they each brought which causes things like “Haflapple” and “Splonge” to come tumbling out of a person’s mouth. But with all the people out there forgetting words – or worse, using the wrong words – Pinkloids are kept very busy, so it’s no wonder they can’t always get it just right; they try their best though. And the funny thing is, thousands of people have encountered Pinkloids and didn’t even realize it. Worked back and forth. Always start in second chain from hook. sl st in remainder of chains. cut yarn (leave long enough tail to sew to head). See photos for suggested positioning and attach all the pieces. . . sort of like Mister Potato Head. . .
Purploids are great to go to for advice, Pinkloids are masters of the Right Words, so what is it Bloops do, you may ask? Typically they steal fresh laundry and try to nest in it. See photos for suggested positioning. Simple though these are, they’re pretty fun and cute each in their own way.